2011 Rand McNally Deluxe Motor Carriers Road Atlas Laminated and spiral bound motor carrier road atlas for heavy-duty users. The No. 1-selling trucker's road atlas in North America is as tough as the rig they are driving. With its laminated pages and spiral binding, the Motor Carriers Road Atlas can stand up to any wear-and-tear from the road. And with the 21-page mileage directory, estimating trips and costs just got easier. Rand McNally Kids' Road Atlas Rand McNally's Backseat Books® series is a great source for fighting those boredom blues. Kids' Road Atlas features real road maps, great travel games, state-by-state puzzles, state facts (including the nickname, capital, flower, tree, and bird), an index, and much, much more. These colorful, fun-filled books are perfect for keeping the kids busy at home or during those long stretches. Backseat Books® Boredom cured. Rand McNally Folded Maps Rand McNally's folded map series featuring different areas of the Central United States is a must-have for anyone traveling in and around that part of the country. It offers unbeatable accuracy and reliability at a great price. Our trusted cartography shows all Interstate, state, and county highways, along with clearly indicated points of interest, airports, county boundaries, and more. 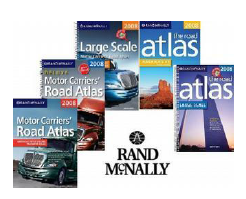 See why Rand McNally folded maps have been the trusted standard for years.